I found something I wrote to my mentor two years ago and thought I would share it with you because I realize I have not changed this behavior and it is still what I do today. When things are going well I turn to God and thank Him along the way -but rarely wait to listen for God's reply. When things in my life are so horrific as to affect my ability just to even breath, I get on my knees and beg God-BEG for help and comfort and answers. Sometimes I pause and wait for some feeling of what I need to do but often I do not wait. I just go forth and do things under the guise of thinking I am being guided in someway; things that, as often as not, damage myself or others or the situation. When things are just okay and I am having normal daily life issues: nothing significant, nothing with angst or pain; I usually forget to turn to God. Why? Do I not want to bother God? Do I have a 'He's busy- unavailable parent' mentality for my relationship with God? Or do I think I know the answer God would give me because I want things my way. I forget to pray. If I forget to pray then you can be sure I am not pausing to listen. I think if you asked God what it was like guiding me, God would reply "Jane doesn't wait for the Guide, she is always trying to take the point." I am trying to pause more often in my day. Pausing without losing forward momentum has always been my problem. When I pause, I feel I lose focus; I falter. Even a brief pause seems to throw me off the path of what I need to do. Today I am wondering if my problem is simply one of oil and vinegar. Pausing and forward momentum are opposites. They cannot co-exist in the same moment. Perhaps I am supposed to lose my momentum and allow for a change of focus as part of being guided. Perhaps the benefit of pausing only comes with really letting go. It is a simple concept for anyone who is not wrapped up in thinking they must control everything in their world, which means it is a hard concept for me. 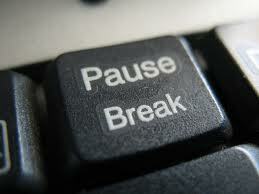 Do you pause without really letting go? I know what you mean about pausing. Sometimes I'm hesitant to pause, because the urge to keep going is so strong. And you're right, it is mostly a control issue. Some of us had little control of our lives as children, so we now feel that we have to be hypervigilant and control most aspects of our lives. Finding a happy medium would be beneficial. I am working a great deal on the feeling of God being the "unavailable parent"... it's a continuous issue for me. I need to speakto God all of the time, yet, I don't. I "forget". Sometimes even in the midst of my intense struggle, I don't. Why? I ask myself this often. I have a past of an absent father and struggling mother who was raising us kids alone. I think I am still in that mentality - gotta do it yourself, there is no one around to help you. It's such a learning process, always.